The Sahana Software Foundation has partnered with Google to mentor students for Google Summer of Code every year since 2006. 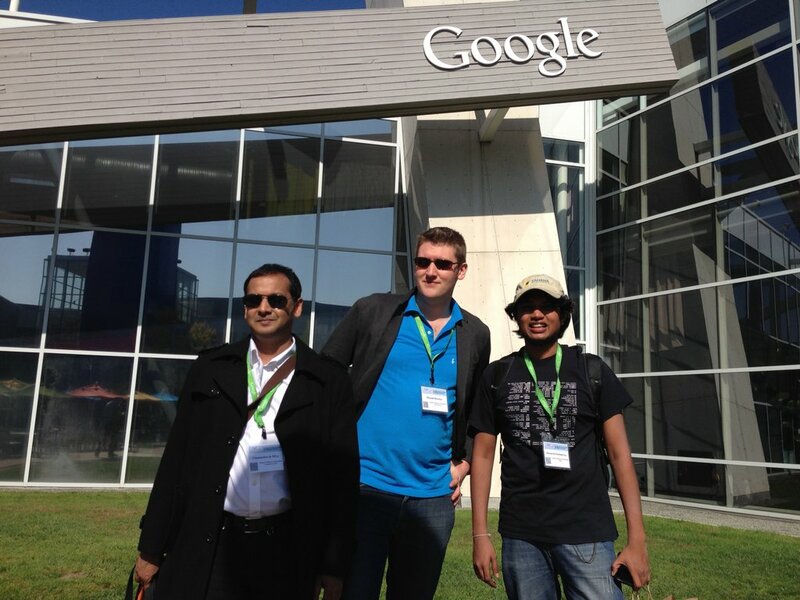 As such, mentors from the SSF are invited to participate at the GSoC Mentor Summit at Googleplex in Mountain View, CA each year. The Mentor Summit is, in the words of the organizers, an ‘unconference’, where the attendees decide on the agenda and the content of each discussion. This is an approach which fits in to the values of collaboration and community engagement that are inherently available in the realm of open source. The GSoC Mentor Summit for 2013 was held on the 19th and 20th of October, and Chamindra De Silva, Michael Howden and Ramindu Deshapriya represented Sahana this year. The Summit is generally a good opportunity for the members of Sahana to generate some recognition for our organization and to meet old acquaintances as well as to forge new relationships. These were the goals of our representatives as they met and interacted with many members of open source communities from around the world. One of the main focuses for the representatives from Sahana was to drive some of the sessions related to Humanitarian Open Source Software (HFOSS). In one such session, it was decided to work towards better collaboration between HFOSS projects in terms of co-mentoring GSoC students as well as presenting a common front via a portal to the world. The #hfoss IRC channel was discussed and a resolution was made to enhance participation on the channel. Projects such as Sigmah and MiFOSS as well as OsGeo signed up to work towards enhanced collaboration between HFOSS projects. Another session involving all HFOSS projects placed the topic of achieving better involvement from GSoC students under discussion. Many valid points related to keeping students engaged after their GSoC Projects are complete were discussed and agreed upon. Since Sahana has been a mentoring organization for Google Code-In (GCI) 3 years in a row now, Michael and Ramindu attended a session which focused on best practices for GCI mentoring organizations to follow. Our representatives were able to pick up many valuable points related to managing GCI effectively. As always, the GSoC Mentor Summit was a place to meet and network with representatives from many well-known FOSS projects from around the globe. It was exciting to explain how Sahana works to those who did not know of it, and it was heartening to meet someone who recognized Sahana from what they had heard about us. It was an all-round wonderful experience to meet members of some of the greatest FOSS projects out there, and to know that the SSF is on par with them as a FOSS organization. Having gained a great number of new ideas and having made many new friends as well as having renewed old friendships, it must be said that Sahana definitely made an impact at the 2013 GSoC Mentor Summit. We hope the future will hold many such opportunities with collaborate with the global FOSS community and Google to provide better Humanitarian solutions to the world.